What will The Walking Dead do without Rick Grimes? What does AMC have planned now that the former main character of the series is definitely, absolutely, obviously never coming back? I’ll say another sentence here so I can get past the paragraph auto-published to the main page and provide a spoiler warning. This is the last sentence: only a few more words before I stop lying. Okay…..*deep breath*….all of you who watched the episode know what I’m about to complain about. AMC chickened out. Andrew Lincoln’s “last” episode was full of strife and struggle and bleeding guts, flashbacks and cameos and memories. It’s textbook pathos for a departing character, but it was given emotional heft from the fact that you really knew he wouldn’t make it. The only question was how he wouldn’t….and nobody wanted to see him devoured by a zombie horde, so the hour had my captive attention. Ultimately, Rick went out the hero, blowing himself up and sacrificing his new bridge in the process. Michonne screamed and even Daryl started tearing up. It was an amazing scene. Then Jadis showed up with her magic helicopter and whisked a living Rick away while Wang Chung moodkiller blared in the soundtrack. So that happened. It was quite obvious from the way this episode ended that AMC, already faced with declining ratings, is terrified of millions of viewers taking Lincoln’s departure as their cue to stop watching the show. Which would be a mistake in my opinion; Angela Kang has done a marvelous job re-centering the series over the past few episodes, focusing more on the characters — ALL the characters — than manufactured peril. 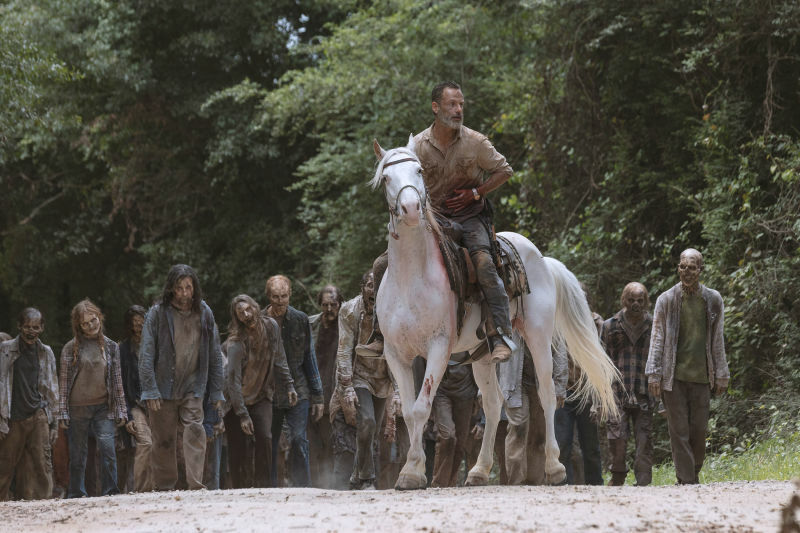 The show was learning how to survive without Rick, and…well, so much for that. That’s why we got an extended look at the remaining three episodes of this half-season, and Scott Gimple announced during Talking Dead that AMC was now working on WALKING DEAD TV MOVIES! This plan had already previously been revealed, but the focus of them (Rick) had not. This is their way of having their cake and eating it too. But reality doesn’t work that way and you can’t yank your fans around like this if you expect to keep them. Then again, this is far from the first yank. The series “killed” Glenn a few years ago only to reveal he was under a dumpster the whole time. One season later they killed Glenn for real, but delayed the reveal for six months as Negan stalled for time before whacking an unseen man seconds before the end of the season. The fanbase has been through this dance with AMC before. Will they forgive this stunt too or will it be one exploded bridge too far? Filming on the first Rick Grimes movie has yet to commence, but will start up sometime in 2019.